Summary: The beginning of winter is often a time of celebration, as we chase away the gloom with eating, drinking, and socializing. Some of us opt for a more “hygge” approach and like to cuddle up by the fire alone, or with someone we love, wrapped in a cozy blanket. A good vegan beer or wine is perfect for either scenario. The beginning of winter is often a time of celebration, as we chase away the gloom with eating, drinking, and socializing. Some of us opt for a more “hygge” approach and like to cuddle up by the fire alone, or with someone we love, wrapped in a cozy blanket. A good vegan beer or wine is perfect for either scenario. Many people assume that all beer and wine is vegan, if they even give it a thought. They’re made from fermented grains or grapes, right? We were dismayed to discover that many companies utilize animal products in the manufacturing process. When drinks are filtered before bottling, they often use such substances as isinglass (made from fish bladders), gelatin, egg whites, and sea shells. Unfortunately, vegan beer and wine companies don’t label their products to show they’re safe for consumption by folks who eschew animal products. However, a quick perusal of the internet can help. If you need a few suggestions to help you get started, here’s a handy list. Deschutes Brewery, www.deschutesbrewery.com. This Bend, Oregon-based brewery is almost completely vegan, with the exception of a few specialty brews. Its beer is available in 28 different states, so you should have an easy time finding it, especially if you live on the west coast. According to their FAQ section: “We do not use animal products in the cellaring or brewing process. The clarifying agent we use in our brewhouse is made from Irish Moss, a red algae. However, experimental beers brewed at our pubs sometimes use lactose, isinglass, honey or other specialty ingredients, but we call it out in the description listed on the menu.” Their popular Jubelale is great for your holiday festivities. Available from October through December, this robust, vegan brew boasts notes of cocoa, dried fruit, and toffee. You and your guests will love it! Frey Winery, www.freywine.com. Mendocino-based Frey makes the claim of being “America’s first biodynamic winery.” They hold 90 percent of their land as a natural habitat for plants and animals. Since 1980, they have produced vegan, gluten-free wines with no added sulfites. Their 2015 Biodynamic Syrah utilizes the flavors of layered fig, anise, briar and bay leaf. It’s a delicious, elegant accompaniment to any holiday meal. Bell’s Brewery, www.bellsbeer.com. The Kalamazoo-based brewery is constantly rolling out new varieties of beer, and almost all of them are vegan. 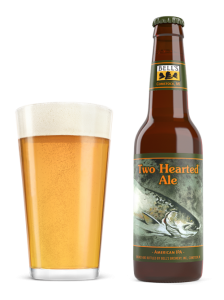 Their popular Two-Hearted Ale is a smooth, vegan IPA, dark and not too hoppy. It’s available all year but is perfect for winter consumption. Brewed with 100 percent Centennial hops from the Pacific Northwest and named after a river in Michigan’s Upper Peninsula, this brew never disappoints. You can enjoy it with almost every meal. Unfortunately, if you live west of the Mississippi, you’ll have a hard time locating it, and Michigan state law forbids shipping beer to other states. But it’s ubiquitous in the Midwest and East Coast, so check your favorite store or pub. All of these offerings are available at stores. If you’re at your local supermarket and can’t find any of them, www.barnivore.com is a great resource for determining which alcoholic beverages are vegan. Just tap a product name into Barnivore’s handy search bar, and the site will let you know if it’s vegan-friendly. There are nearly 43,000 companies in their database. Enjoy responsibly! Previous Article « Sweet Vegan’s Gluten-Free Vegan Brownies!